The financial power of attorney allows another person to handle your business affairs just as you would be allowed to. With it, you can enable your agent to sell or rent your real estate, cash or deposit your checks, sell your stocks or personal property, and most any other financial transaction. This can come in handy if you will not be able to perform these actions yourself because of an extended vacation or because you have to devote time to more substantial operations. You should not choose an agent lightly. They can wield great power over your property, so you should only grant someone these powers if you have complete trust in that person. You should also think carefully about which powers to assign to your agent. Even if you trust him completely, there may be no purpose in assigning the agent broad powers if you only need him to pay your bills. You should also consider how long the document should be in force, and make sure your agent understands what services you need. 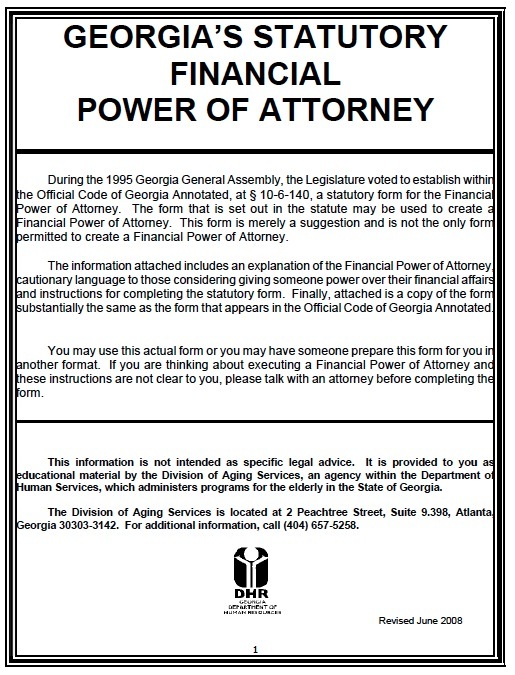 In Georgia, you can revoke a power of attorney at any time. To do so, simply write, sign, and date a document that states you are revoking the power of attorney, and give it to your agent.